Got you Mr Trump! Vladimir Putin. Even by the standards of the malignancies that surround US President Donald Trump personally, the one reported by The New York Times on January 11 was stunning in its implication. The Times reported that the Federal Bureau of Investigation (FBI) had opened a counterintelligence investigation to ascertain if the President was a Russian agent in the aftermath of him firing the agency’s director, James Comey, on May 9, 2017. Given the frenzy of daily newsbreaks about this president, anyone of which would have long unseated any other incumbent, damning news stories just slide by. 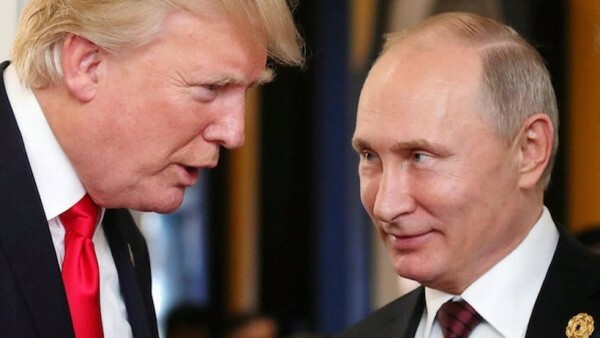 However, this particular one has been so extraordinary that it may yet foreshadow what a likely report by special counsel Robert Mueller, who is examining the very aspects of Trump and/or his campaign’s alleged dalliances with Russia’s President Vladimir Putin, could eventually reveal. Think of it as India’s Central Bureau of Investigation (CBI) opening an investigation into whether the country’s Prime Minister is working on behalf of Pakistan. A lot of people may not even be able to process the devastating import of a US President suspected of being a Russian agent but that is precisely what the FBI wanted to find out. Counterintelligence officials within the FBI are particularly serious-minded and they embark on any investigation with great deliberation. To think that they would be so alarmed as to suspect no less a person than the incumbent US President is unprecedented. Within the investigation was the apprehension that Trump is a possible threat to national security. Trump himself has described the Times report as the “most insulting” thing anyone has said about him but has not explicitly denied it. Any denial, of course, would be superfluous in the sense that even if he were “wittingly, unwittingly or half-wittingly”, as the famous journalist Carl Bernstein described it, acting as Russia’s “pawn” he was unlikely to admit to it. The point here though is much larger. The very initiation of such an investigation underscores the depths to which America’s national concerns have fallen since the emergence of Trump on the political stage. It is conceivable that some of Trump supporters may cite the investigation as the ultimate proof of a “deep state” striking back and trying to upend the popular electoral will in electing Trump. However, the FBI’s counterintelligence is not known to embark on any action lightly at all and without very serious intimations of a national security threat. As the Times story pointed out: “No evidence has emerged publicly that Mr. Trump was secretly in contact with or took direction from Russian government officials.” However, “emerged publicly” is the operative part of that sentence. It could well turn out that the FBI overreached in its concern about the President but that is still not conclusive since Mueller is yet to issue a report of his findings. Counterintelligence investigations are by their very nature often open-ended and not conclusive in the traditional sense of criminal investigations. They can begin and end equally quietly without the public finding out the specifics. It is that aspect of such an investigation that opens the FBI to Trump’s oft-repeated charge of a “deep state” working against him. Of course, it is a politically expedient refrain that Trump knows helps him with his political base that has so far bought everything he has sold them. It is hard to say what, if anything, the investigation found that might indict or exonerate the President. It may never be found in explicit terms or, for that matter, any terms. It may or may not buttress the Mueller inquiry. It is that uncertainty that makes it vulnerable to Trump’s political grandstanding as he prepares for the 2020 presidential election. “It’s the most insulting thing I’ve ever been asked,” Trump said but did not categorically deny it. It almost seemed staged that Pirro would ask and he would respond the way he did. It is a measure of how benumbed the national mood has become because of the relentless parade of seriously upending news stories since he became President that even a question like that is unlikely to do any real political damage to him right now. It is only when Mueller issues his report and its entire content is made public will America and the world know whether the stories are malignant or benign.